San Fierro Bay is the bay located to the north of San Fierro, San Andreas, over which Gant Bridge extends. This bay separates San Fierro from the town of Bayside, and is the location of the Da Nang Boys' cargo ship that becomes a focal point during a few missions for Wu Zi Mu. To the east of the bay is Tierra Robada, while its western edge abuts the ocean. San Fierro Bay comprises the northwestern portion of the water mass surrounding San Fierro. The other portion lies to the southeast in Easter Bay, which is home to Easter Basin and Easter Bay Airport. 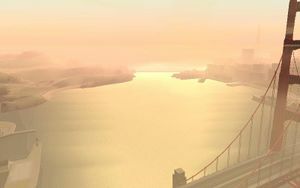 San Fierro Bay provides spectacular scenery and opportunities for amateur photographers to capture images of the famous Gant Bridge. Consequently, numerous watercraft can be found moored, anchored, and piloted throughout this picturesque body of water. Carl Johnson is in the midst of converting the derelict garage he won in a street race with Claude and Catalina into a successful chop shop when he receives an unexpected visitor: the mysterious Wu Zi Mu (Woozie), who Carl had also raced with and beaten earlier. As it turns out, Woozie is the head of the Mountain Cloud Boys Triad in San Fierro, and at war with the recently immigrated Da Nang Boys, a Vietnamese crime organization. In order to solidify his alliance with Woozie, Carl agrees to help in the fight against the Da Nang Boys. After successfully thwarting an attack in Chinatown and acting as a decoy to allow Woozie's superior in the Red Gecko Tong to escape, Carl is asked two final favors: to bug and later infiltrate the Da Nang Boys' cargo ship in San Fierro Bay. To achieve this, Carl first swims across San Fierro Bay, whilst evading patrolling gunboats, to climb aboard the vessel and plant the bug. Later, during a helicopter attack on the ship, Carl is again plunged into the bay, and has to swim his way over to the ship again, this time to kill all gang members aboard (including their leader) and rescue a group of imprisoned refugees. After these events, Carl's services to Woozie in San Fierro come to an end, as Woozie departs for his new headquarters in Las Venturas to start a casino business. This page was last modified on 9 August 2012, at 14:00.